Seventeen medieval cameos, with religious subjects, can be seen on this cup. Five modern ones, made in Munich, were added when the cup was skilfully altered to make an attractive piece for the art market. 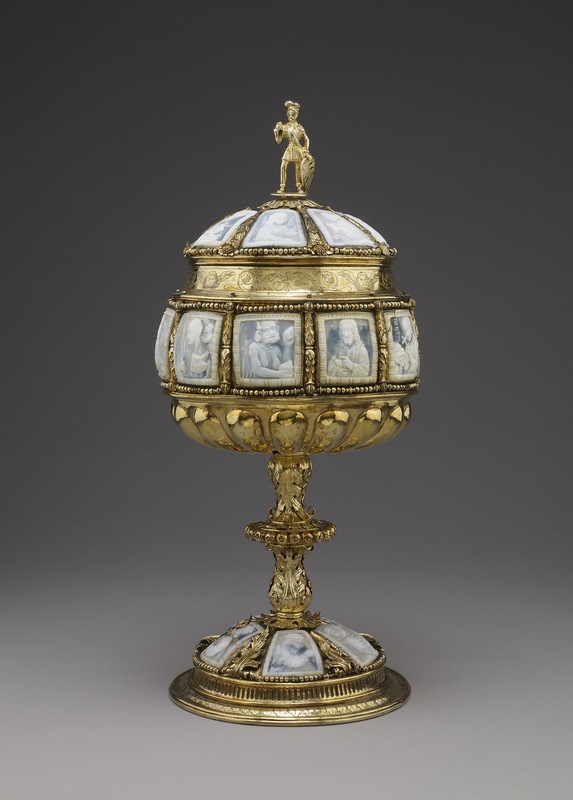 Standing cup and cover; silver, gilt and chased; bowl and cover together are oviform and, like foot, divided into quadrangular panels, each set with cameo on shell; on cover: Virgin and Child, angel, St Thomas Aquinas (? ), Tobit, St Bernard, St Gregory the Great, tonsured saint with lance; separated by cornucopiae; bowl: Jesus Christ, St Margaret, Tobit, St Nicholas, angel, Virgin Mary, St Peter with sword, angel, St Geneviève, the Devil; separated by baluster columns; foot: St Cosmas, St Damian, St James, St Peter with sword, Tobit; separated by leaves in relief; lip engraved with floral scrolls, radiating lobes at bottom; baluster stem covered in acanthus leaves, flat knop, border of apples set close together; modern figure with shield on top of cover. (i) Shell cameos: seventeen plaques, French, early 16th century; five plaques, modern (perhaps Munich, mid-19th century). (ii) Silver-gilt covered cup; unmarked; probably German, second quarter of 16th century with modern alterations. Commentary: An origin in France, probably in Paris, c. 1500, for the seventeen original shell cameo plaques has never been disputed. However, the origin of the remaining five modern plaques has not been established. Three of the five (10/5, 10/9 and 10/17) are direct - albeit greatly inferior - copies of the originals that are now mounted elsewhere on this standing covered cup, the earlier history of which is unknown. If the other two modern cameos - the 'Archangel Raphael' (10/15) and the 'Priest with a chalice' (10/16) plaques - are also copied from originals, the latter must have been available for copying in the same nineteenth-century workshop where the other three had been carved. The present location of those two originals, however, remains unknown, and so, alternatively, the two new plaques on the cup (10/15 and 10/16) might have been the invention of this nineteenth-century craftsman. The problem of determining the whereabouts of this workshop in Europe is, therefore, important to resolve. Perhaps the most curious and hitherto unnoticed piece of evidence about this copyist's activities is the survival in the British Museum of one of his failures - a copy of the St Cosmas cameo (10/22). This spoilt version remained in its unfinished state, following the accident when the craftsman's tool slipped and tore a gash diagonally across the bottom right-hand corner of the plaque - perhaps even causing the simultaneous fracturing of the left-hand side. For some odd reason the ruined plaque was not destroyed, and in 1885 it was presented to the Museum by Sir A. W. Franks, then Keeper of the Department of Medieval and Later Antiquities in the British Museum (reg. no. 1885,0508.110). However, Franks did not record any information about its earlier history or even the date and source from which he had acquired it. At that time it was neither recognised as a modern piece nor as a representation of 'St Cosmas', since it lacked an inscription and the Waddesdon Bequest of 1898 had not yet arrived in the British Museum. In Dalton 1915 it was described as “he half-figure of St Cosmas, French, 16th century, L. 1.42 in” and, furthermore, its resemblance to the cameo plaque on the Waddesdon Bequest standing-cup was acknowledged, with the comment that it “is evidently the work of the same school”. A closer examination of the Franks example reveals that the accidental damage - not described or even mentioned in Dalton 1915 - probably occurred when the plaque was more than two-thirds completed. By comparing it with the original (in the Waddesdon Bequest), there can be little doubt that the only remaining details to be carved were the Saint's left hand and sleeve, together with the cylindrical mortar, and the decorative band on the right-hand side of the square frame. Equally evident is the copyist's failure to match the artistic quality, especially in the face, of the original; even small details, such as the tip of the Saint's thumb emerging from behind the pestle, have been lost by the copyist. In an attempt to add conviction the copyist has, however, introduced meticulously executed details; for example, the puckering of the folds below the v-shaped neck of the Saint's top garment; unfortunately, this detail is used so repetitively that the overall effect looks unnatural. Similarly, the cuff of the Saint's right sleeve, which on the original is so naturalistically rendered with a slight kink in it, has been lifelessly carved in an insensitive way by the copyist. Frank's acquisition of this unprovenanced, wholly white, broken and unfinished cameo plaque occurred before 1885, and in the light of this recent comparative study there are now even firmer grounds for doubting the authenticity of a second wholly white shell cameo, also given by Franks in 1885 (reg. no. 1885,0508.109; see Dalton 1915, p. 32, cat. no. 210, pl. III). This rectangular plaque (L. 1.3 in), which also lacks any earlier history, is in perfect condition and is set in a modern metal mount (with suspension loop); curiously, a piece of paper cut to the correct size is pasted over the entire back of the shell. In Dalton 1915 it was described as depicting “a peasant. . . early 16th century” and was compared with the 'similar shell-cameos' on the Waddesdon Bequest standing covered cup. However, it is quite unlike any of the seventeen original cameos on the cup and cover; neither stylistically nor technically does it compare convincingly with any of the similar, but securely documented, cameos (discussed below), which are today preserved in the Cabinet des Médailles, Paris, the Treasury of St Antonio, Padua, the Hapsburg Schatzkammer, Vienna, and the Bayerisches Nationalmuseum, Munich. Indeed, the large Munich group - all mounted on the famous 'Reliquary of Halle' which was first recorded (with illustration) in the 'Hallesche Heiltumbuch' of 1526-7 and was subsequently preserved in Bamberg Cathedral until the beginning of the nineteenth century - is particularly relevant, because one of the two shell cameos depicting the Adoration of the Shepherds is carved with a single standing figure of a shepherd wearing a fleecy hood and carrying a long-handled crook resting on his left shoulder. Despite the profound difference in the treatment of the figure, many of the details of dress and accoutrements are similar, and it would seem that the copyist has (in the Franks smaller mounted example) misunderstood the sheepskin over his head and shoulders and, consequently, has produced a very squat figure dressed like a jester carrying (to quote from Dalton 1915, p. 32) “a shovel with long handle ... a cow-horn and a pipe”. Furthermore, the curious mechanical treatment of the ground and the over-elaborate 'columns' forming the sides of the frame of the Franks cameo are without parallel among the well-documented cameos of this French school, c.1500. In conclusion, this 'peasant' plaque, given by Franks in 1885, has all the characteristics of a modern pastiche and, if the faker was basing it on the standing shepherd of the famous 'Reliquary of Halle', his workshop would probably have been in Munich, where since 1860 the 'Reliquary' was displayed in the Bayerisches Nationalmuseum. A South German origin for the five modern plaques mounted on this silver-gilt covered cup, therefore, seems highly probable, especially in the decades between 1850 and 1870. In this connection it is important to review the status of the set of eight shell cameo plaques that was purchased in 1859 by the South Kensington Museum (subsequently renamed the Victoria and Albert Museum, inv. no. 6582-9-1859). This set was purchased without any history for £1 and, curiously, has received little attention from scholars over the last 130 years, despite the presence of an incised date on the two largest and an incised 'signature' on each of the eight plaques. When they were recently published, they were again given the old attribution: “German, signed "F", dated 1570” (see C. I. A. Ritchie, ‘Shell-Carving: History and Techniques’, Cranbury, New Jersey, South Brunswick and New York, 1974, illus. on p. 196). The so-called signature appears in the same place on each panel - the bottom right-hand corner but on the frame itself. Furthermore, it is not an F but a monogram, TF, which has been carved in a consistent form on all eight frames. The so-called date, on the other hand, is less assuredly carved, although it also appears on the frame (bottom left-hand corner of the Death of the Virgin and the Christ in Judgement plaques). However, the date is executed incompetently in Roman numerals: MDIXX; the letter after the D has been read as an L in order to make sense, but even under high magnification it fails to convince. Furthermore, by 1570 the style of these eight plaques would have seemed very old-fashioned indeed; it is based on the Düreresque style of late fifteenth- and early sixteenth-century German prints and woodcuts, especially from Nuremberg. Although there is no lack of competently carved detail on each panel, it tends to be repetitive and insensitive; more alarmingly, the figures - and especially the faces - are feebly carved, as if slavishly copied. The shells are without exception white, and the backgrounds are strongly and evenly coloured to resemble the early sixteenth-century shell cameos; indeed, each panel has a thick backing of a pitch-like resinous substance, the outer surface of which is embedded in a coarse textile (linen?) fabric. Although this set, with its strange mixture of scenes from the Life of the Virgin and the Life of Christ, was made before 1859, it probably had recently originated in a mid-nineteenth-century South German workshop, perhaps in Munich. Such an origin could also account for the various alterations carried out about the same time to a genuine German silver-gilt cup and cover of the early sixteenth century in order to accommodate the twenty-two shell cameo plaques that now decorate the covered cup in the Waddesdon Bequest. (i) Nine of them bear inscriptions, most of which are unequivocably written in French. (ii) Many of the seventeen exhibit strong French characteristics of style, especially during the transition from the late Gothic to the early Renaissance. (iii) The eight identified saints include several that had a particularly widespread devotion in France - for example, St Bernard of Clairvaux (1090-1153), the founder of the Cistercian Order, and St Geneviève, patroness of Paris, who died there and whose body, reputedly interred in 512, became the focal point of a popular shrine in the early Middle Ages, when St Elois, goldsmith and Bishop of Paris, is said to have made in 706 the famous Châsse de Sainte Geneviève. The Châsse, known to have been restored in the thirteenth century, was repaired (with detailed records) under Louis XIII by Pierre Nicole, a Paris goldsmith who carried out the work in 1614-16. It remained in the church of the old Abbey of St Geneviève, near to La Sorbonne, until it was destroyed in the French Revolution in 1793 (see Germain Bapst, La Châsse de Sainte Geneviève, ‘Revue Archéologique’, 3rd Series, VIII, Paris, 1886, pp. 174-91). (iv) The best-documented shell cameo plaques of this type to have survived are those taken from the Châsse de Sainte Geneviève by order of the Commune de Paris, when in 1793 it authorised the confiscation of the shrine and all the works of art in the parish of St Geneviève. They were taken to the Paris Mint and, after three years, the cameos were officially transferred to the Cabinet des Médailles, where they remain today (E. C. F. Babelon, ‘Catalogue des camées antiques et modernes de la Bibliothèque Nationale’, Paris, 1897, pp. cxlix-cl, nos 421, 476, 481, 580-2, pls XLIV and LVII; in addition, nos 387, 390 and 579 are presumed to have reached the Cabinet des Médailles at the same time since there is no other record of their acquisition; however, proof is lacking as they are not exactly described on the 1796 list, although the briefly mentioned items 44 and 46 on the list could refer to them: see Babelon 1897, p. clix; also E. Veljovic, in ‘Vrai ou Faux? Copier, imitier, falsifier’, exh. cat., Cabinet des Médailles et Antiques, Bibliothèque Nationale, Paris, 1988, p. 94, nos 27-9, pl. XI, where it is also stated categorically that the contrasting colours - bluish grey and white - are not in the make-up of the shell but are artificially created by applying a blackish coating after the carving has been completed, thereby leaving the thicker parts in high relief in the natural colour of the shell, white. The subtle unevenness of the application of colour is said to be a deliberate attempt to imitate the pearl oyster (huître perlière), from the shell of which they were believed to have been carved). After the middle of the nineteenth century, therefore, the Padua shell cameo covered cup was well known from Gonzati's detailed description, including his full discussion of the cameos for which he had proposed a French origin. Most recently, it was again catalogued in 1981 (see G. Mariacher in ‘S. Antonio I231-1981, Il suo tempo, il suo culto, e la sua città’, exh. cat., ed. G. Gorini, Padua, 1981, pp. 136-7, no. 95, with 3 illus., where - as in Rosenberg 1925, pp. 34-5 - it was attributed to the goldsmith Ludwig Krug of Nuremberg, “c. 1490-1552” [sic] and where the Bibliography terminated in 1966, thereby omitting H. Kohlhaussen, ‘Nürnberger Goldschmiedekunst des Mittelalters und der Dürerzeit 1240-1540’, Berlin, 1968, pp. 387-8, no. 400, where the Nuremberg punch-mark (R3 3687) was misleadingly cited, but where the cameos were recognised as being “französisch Anfang 16. Jh.”; for the latest discussion of the Padua shell cameos see McCrory 1988, p. 414, fig. 6). Among the twenty-three plaques on it are twelve square plaques (arranged in a frieze around the bowl of the covered cup) which correspond closely to those in the Waddesdon Bequest, being an equally odd assortment of half-length figures within similarly carved frames in relief. Some have vertically carved inscriptions in French in the same form of lettering - MARIE MADELEINE and GIROVME, for example. Most strikingly, the figures are all executed in the same distinctive style and, indeed, the plaques of St Mary Magdalene, St Jerome with his Cardinal's hat, an angel holding up a crown, St Francis receiving the Stigmata, and, in particular, the Annunciation pair of plaques are all demonstrably from the same workshop, even perhaps by the same hand. Furthermore, the plaque of the Executioner is a very close variant of the original cameo on the foot of the Waddesdon Bequest standing covered cup (10/19). The remaining six plaques comprise St Martha, St Catherine, King Solomon, David (?) and two alternative versions of St Jerome (penitent before the Crucifix) and St Mary Magdalene. This kind of repetition, with only minor variations in detail, was discussed in 1988 in relation to one of the twelve plaques on the bowl of the covered cup in Padua, the King Solomon with sceptre plaque (McCrory 1988, p. 418). Attention had there been drawn to its close relationship with the pear-shaped cameo of Salomon without sceptre in the Carrand Collection (Museo Nazionale del Bargello; M. Casarosa Guadagni, ‘Cammei in conchiglia del Rinascimento’, Florence, 1988, p. 20, no. 1) and to the cameo plaque inscribed IOSAPHAT (also without sceptre), which came from the shrine of St Geneviève in Paris in 1793 (Cabinet des Médailles; Babelon 1897, p. 228, no. 401, pl. XLVI). Similar subjects, arranged in a row of sixteen plaques - all half-length figures, some with sceptres - appear on the much restored 'Reliquary of Halle', now in the Bayerisches Nationalmuseum, Munich, having previously been preserved in Bamberg Cathedral and in 1526-7 been listed and illustrated in the 'Hallesche Heiltumbuch' because at that time it was part of Cardinal Albrecht von Brandenburg's great collection (R. Berliner, Französische Muschelschnitte, zugleich ein Beitrag zur Geschichte der Sakularisation in Bayern, ‘Münchner Jahrbuch der bildendun Kunst’, N.F., vol. I., 1924, pp. 26-49; P. M. Halm and R. Berliner, ‘Das Hallesche Heiltum’, Berlin, 1931, p. 66, no. 339, pl. 180; Jörg Rasmussen, Untersuchungen zum Halleschen Heiltum des Kardinals Albrecht von Brandenburg, in ‘Münchner Jahrbuch der bildenden Kunst’, 3rd Series, XXVII, 1976, pp. 94-5, fig. 33; Casarosa Guadagni 1988, p. 11, figs 3-4). The evidence, therefore, points to a workshop in Paris that was carving these shell cameos in considerable numbers, often duplicating the subject, though not necessarily repeating it line for line, and that, perhaps before the 1520s, had the specific intention of selling them abroad, especially to Germany, where patrons such as Cardinal Albrecht von Brandenburg clearly held them in high regard. Indeed, the Cardinal had a second example - a tall silver-gilt nef (or ship) reliquary surmounted by the figure of St Ursula - which was set with a variety of shell cameo plaques both on the foot and on the sides of the vessel; once again the square plaques (with an odd selection of half-length figures) were arranged as a frieze but separated by raised vertical silver strips of foliate ornament of alternating late Gothic and transitional Renaissance design (Halm and Berliner 1931, p. 60, no. 286, pl. 176; Tait 1981, p. 91, fig. 67; McCrory 1988, p. 414, fig. 5). The goldsmith's work of the nef in the 'Hallesche Heiltumbuch' has consistently been attributed to the workshop of the Nuremberg artist and goldsmith Ludwig Krug (master in 1522, died in 1532), although no marked piece of silver or gold by this master is extant. His mark (a jug between the letters L and K) is occasionally found on engravings, and is on at least one woodcut, a bronze plaquette and a single small stone relief. The only evidence of his oeuvre as a goldsmith is a drawing in the 'Hallesche Heiltumbuch' of 1526-7, which records a lost silver-gilt standing covered cup with scenes from the Passion in relief around the bowl and the figure of a woodman chopping at a tree-trunk forming the stem; the circular foot, depicted as a three-dimensional mass of foliage and strewn branches, has the mark of Ludwig Krug clearly drawn on the severed branch projecting above the foot-rim (immediately behind the figure of the woodman), although it is a most unlikely place for the mark to be struck. There is no precise similarity between the covered cup in this drawing and the nef - nor, indeed, between it and any of the other pieces of silver plate that have since been attributed to Ludwig Krug and his workshop in Nuremberg between 1522 and 1532, such as the two magnificent covered cups listed in the inventory of the Ambras Collection in 1596 and subsequently moved to the Hapsburg Schatzkammer (see Stephan Krenn, in ‘Führer durch die Sammlungen’, Kunsthistorisches Museum, Vienna, 1988, p. 148, with illus. ; E. Kris, ‘Golschmeidearbeiten des Mittelalters, der Renaissance und des Barock. I Teil: Arbeiten in Gold und Silber’, Publikationen aus den Kunsthistorischen Summlungen in Wien, Band 5, Vienna, 1932, pp. 11-13, nos 19-20, pls 13 and 81). Nevertheless, a considerable corpus of silver plate has, over the years, been associated with the name of Ludwig Krug (see M. Rosenberg, Heiltumsbücher und Goldschmiedekunst, ‘Zeitschrift für christliche Kunst’, XII, 1891, pp. 372-8; Rosenberg 1925, pp. 33-7 (R3 3756); O. von Falcke, Silberarbeiten von Ludwig Krug, ‘Pantheon’, 6 (1933), pp. 189f; Kohlhaussen 1968, pp. 357-407, figs 524-86; Hayward 1976, pp. 98-9, pls 269-70). Probably among the most confidently attributed 'Krug' silver plate have been the three famous covered cups set with shell cameo plaques; firstly, the St Antonio, Padua, example (already discussed); secondly, the Hercules cup (first recorded pictorially in an inventory of the 1650s but now lost, having been in the Schloss Raudnitz, near Prague); and thirdly the Esterhazy cup, now in the Museum of Decorative Arts, Budapest (see Kohlhaussen 1968, nos 398-400, figs 543-5; also, McCrory 1988, p. 414, figs 6-8). These three pieces, whilst being wholly individual in design and detail, share a common character - the pronounced use of tree-trunk stems and exuberant late Gothic foliage, part of a 'naturalistic style' that permeates so much of the Nuremberg goldsmiths' work produced in the early decades of the sixteenth century under the direct influence of Dürer's drawings for silver plate, such as that famous sheet of five studies (preserved in the ‘Dresden Sketchbook’) on which he scribbled: “Tomorrow I shall draw more of these.” However, the only basis for this confident attribution of the three cups to Ludwig Krug, the goldsmith, is the assumption that he was also a carver of cameos, as the near-contemporary account by Johann Neudorfer states, and that it is likely, therefore, that his cameos would also be mounted on silver cups made in his workshop. (For a discussion of the evidence concerning the shell cameo carvings attributable to Ludwig Krug, see WB.230.) However, it does not follow that all imported French shell cameos were likewise mounted by Ludwig Krug, the goldsmith - and by no other German goldsmith. The Waddesdon Bequest silver-gilt cup and cover - as a piece of goldsmiths' work - has long been attributed to the workshop of Ludwig Krug (see Rosenberg 1925, p. 35, B3 3756c). This is, perhaps, not surprising, despite its lack of the more obvious characteristics of the 'Dürer naturalistic style'. Most of the surface decoration on this cup and cover has been borrowed from the repertoire of Renaissance ornament as reinterpreted north of the Alps in the second quarter of the sixteenth century. This transitional phase is richly represented in designs by Albrecht Altdorfer dating from about 1530 (Hayward 1976, pp. 97 and 340, pl. 31) and in the well-known book of designs for goldsmiths by Hans Brösamer (‘Ein Meu Kunst-Büchlein’, not dated, but the original edition was probably produced in Frankfurt in the 1540s; see I. Kühnel-Kunze, Hans Brösamer und der Meister HB mit dem Greifenkopf, in ‘Zeitschrift für Kunstwissenschaft’, 14, 1960, p. 69ff). Little is known about this artist, who died in 1554, but E. W. Braun concluded that Brösamer must have been active in Nuremberg as well as in Fulda (see E. W. Braun, Uber einige Nürnberger Goldschmiedezeichnungen aus der ersten Halfte des 16 Jahrhunderts in ‘94 Jahresbericht, Germanisches Nationalmuseum’, Nuremberg, 1949). For a more recent discussion of the few extant pieces in this transitional style made by Nuremberg goldsmiths, see K. Pechstein, Zu Nürnberger Goldschmiedekunst der Renaissance in the authoritative exhibition catalogue, ‘Wenzel Jamnitzer und die Nürnberger Goldschmiedekunst 1500-1700’ (Germanisches Nationalmuseum, Nuremberg, 1985, pp. 25ff, figs 18-20; also cat. nos 11-12). 'Transitional' pieces have also survived in the famous civic Treasure of Lüneburg - the 1533 Jonah and the Whale cup, the so-called Brandenburg cup of 1534, the 1536 Janus-head cup, the 1538 Lutke von Dassel cup and the 1541 large sweetmeat standing dish. But these splendid pieces made in Lüneburg, despite certain strikingly similar features, do not seem to be the source for the goldsmith who created this Waddesdon Bequest cup and cover (see A. Appuhn, ‘Das Lüneburger Ratssilber’, Lüneburg, 1956; Klaus Pechstein, ‘Goldschmiedewerke der Renaissance: Kataloge des Kunstgewerbemuseums Berlin, Band V’, Berlin, 1971, nos 1-27). Perhaps the most closely related evidence is to be found in a design for a tall silver flask, only recently attributed to that great innovator and gifted artist Peter Flötner, who was active in Nuremberg after 1522 and died there in 1546. This unsigned Flötner drawing (pen and black ink with a yellowish-green wash) is preserved in the Hamburg Kunsthalle (inv. no. 52003; 36 x 17.8 cm) and was discussed in 1986 by Martin Angerer (in ‘Gothic and Renaissance Art in Nuremberg 1300-1550’, exh. cat., jointly produced by the Metropolitan Museum of Art, New York, and the Germanisches Nationalmuseum, Nuremberg, 1986, p. 449, no. 260). Angerer dated the drawing “after 1540” and has argued that there is conclusive evidence to show that the bearded profile head in the roundel on the side of the flask is a self-portrait - the first to be discovered among his known drawings. The general form of the flask is derived from the traditional 'pilgrim-flask' with the usual two handles at the base of the long neck, but these have been transformed by Flötner, who has adapted a popular Renaissance decorative motif, a pair of cornucopiae. Indeed, he has employed a second and larger pair of cornucopiae to support the flask on either side of its short stem, although in this latter case fruit does not flow from them - only a pair of eagles with outstretched wings. Above the cornucopia handles the neck rises and, as it gently flares outwards, there is a ring of apples arranged in an identical way to those on the flattened knop of the stem of the Waddesdon Bequest covered cup. Furthermore, this motif is twice repeated on the tall stopper, which chiefly comprises an acrobatic cupid balancing a basket of fruit on his head. If the fashion for the 'transitional' style was, indeed, widespread in Germany during the 1530s and early 1540s, then it is perhaps curious that the Waddesdon Bequest covered cup set with shell cameos was not always published as 'German' since in many respects it corresponds so very closely. In Read 1902 the cup was simply described as “French”. Despite Rosenberg 1925 (R33756e), this attribution has been repeated not only in Dalton 1927 but also in Hayward 1976, where on the one hand it was stated that “the cameos appear to be French and the cup corresponds to the designs of du Cerceau or the monogrammist CAP”, but on the other hand it was described as “conjecturally French” and captioned as “French (?) unmarked; about 1530-40” (Hayward 1976, p. 91 and p. 361, pl. 255); and finally in a survey of Ludwig Krug it was stated that it “should, perhaps, be considered as a Krug piece” (Hayward 1976, p. 99). To introduce a note of doubt about the original attribution to a French goldsmith seems fully justified on the evidence of the present detailed study, which has failed to find convincing parallels among the French designs. Indeed, the only solution that fits all the conflicting strands of evidence is based on a reinterpretation of the evidence and recognises the clever part played by a nineteenth-century goldsmith, who adapted a genuine German silver standing covered cup of the transitional period (c. 1520-40), with bold radiating lobes on the underside of the bowl. One such piece, complete with its cover, which has survived in the Württembergisches Landesmuseum, Stuttgart, might almost have been made in the same workshop as the London piece, which, before the modern alterations had destroyed the proportions of the bowl and cover, probably closely resembled the form of the Stuttgart covered cup (see Kolhaussen 1968, p. 396, no. 413, figs 569-70, where it has been attributed to the Krug workshop in Nuremberg, c. 1520-30). By making the necessary changes to the bowl, the cover and the foot the goldsmith was able to apply the twenty-two plaques, five of which were modern versions required to make up the decoration in the manner of the St Antonio cup in Padua. With considerable knowledge the goldsmith borrowed motifs (like the cornucopiae and half-columns) to disguise the crude application of the twenty-two plaques, but with a singular lack of ingenuity he resorted to 'cast beaded' borders threaded on wires and elementary methods of fastening with round-headed pins - the like of which is not to be found among the productions of the workshops of sixteenth-century goldsmiths either north or south of the Alps.